As a coach it is sometimes hard to measure the success of a team, especially in a sport like swimming where the competition is predominately individual. Do you evaluate each athlete’s swims? Do you base the performance of the team in relation to personal best times or overall medal hauls? Or is performances secondary to bigger goals when working with larger groups of athletes? As I recap the recent Pan Pacific Masters Championships that were held on the Gold Coast I have to revisit my own personal goals for team UQ. What I wanted to instil into the competing UQ masters was the feeling of being a team, representing that team on the international stage with a large group of athletes, and for each individual swimmer to walk away from such a big event feeling they had accomplished what they had set out to do. In order to accomplish this it was important to build trust and rapport with the masters athletes at UQ, to have them know that I believed they could accomplish more than they thought was possible. Establishing not just a confidence in themselves individually but also in each other as a team that was bound for success at these games. It meant starting small, learning who each swimmer was, learning what each athlete wanted to achieve and then to encourage them to strive for more. It was about promoting an idea to a group of dedicated swimmers and watching it grow over the next 6 months. At first there was a core group of swimmers that had been competing for some time. But I wanted to expand on this, I wanted the group to grow and be stronger. Stronger together so that each individual success was shared together as a team. As a coach you can’t promise success but you can assure the athletes you work with that you will support them through both good and not so good performances. That is the nature of the game we compete in. And as it would so happen the results were… better than good. The team came together as a supportive unit. They watched as each athlete performed PB swims and the belief that they were all elite swimmers grew across the week. As it does happen at meets some races were not as strong as others, however the original goal of developing a strong team shone through, and each person rallied around for support. This support came from helping with warm-ups before races, debriefing with each other and coaches over results and times, racing together in our successful relay campaigns and having injured athletes come and support even though they couldn’t compete themselves showed that the dynamic was not individual in our group. 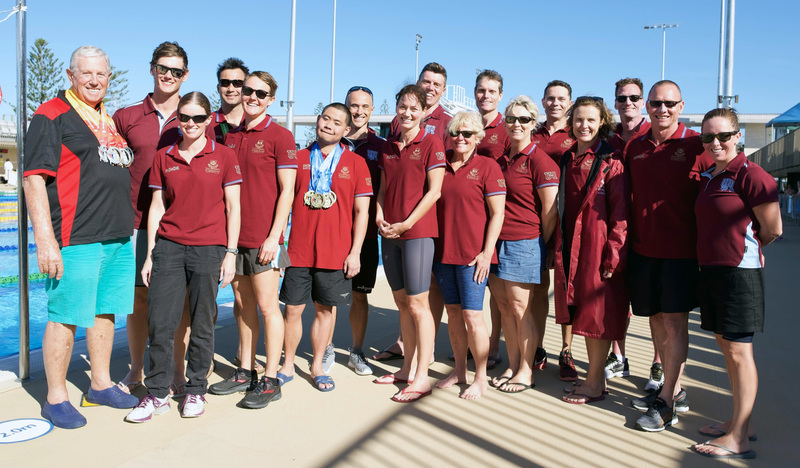 However the biggest success was having family members of athletes supplying cooked lunches and cheering on every time a UQ cap was present in the water showed the camaraderie that was there in our team – Team UQ. I felt as a coach I had achieved my goal to measure success – to establish a group of athletes that embraced team work and the excitement that comes from it. The individual results were a by-product and bonus of this. Congratulations Team UQ and a big thank you to all swimmers in our masters’ squads. These athletes couldn’t have performed without having your support. Time to sign up for the next carnival guys! Yeeeew!